In the past, I have taught a high level of ESE and low-performing students. It wasn’t uncommon for me to have upwards of 13-15 ESE students in one class period. Tracking which accommodations I have used for 13 different students throughout a 50 minute class period was almost impossible. With that many students in a class (plus another 10 or so of regular students without accommodations or special needs), I needed to spend my time TEACHING, not tracking. This left me scrambling at the end of every month to complete my accommodations usage charts that had to be submitted. And, to be honest, that was often done in haste about 20 minutes before I had to turn it in. This frustrated me every month because my students needed BOTH from me. They needed me to be able to teach them and they deserved the precision of accurately tracked, effective data driving my instruction. I’m a firm believer in the function of data, but, like most teachers, I also live in the real world and teach in a real classroom where those two things do not necessarily co-exist. For this reason, accommodations tracking was a primary goal for me when I created ClassMax. There were a few non-negotiable criteria for me throughout the development process and I think ClassMax has solved all these issues for me – and now for you, too! Uninterrupted teaching – Recording accommodations usage couldn’t interrupt my teaching. ESE and low-performing students need the most from a teacher. I can’t have my face buried in a computer or tablet screen with those kinds of needs sitting in my classroom. 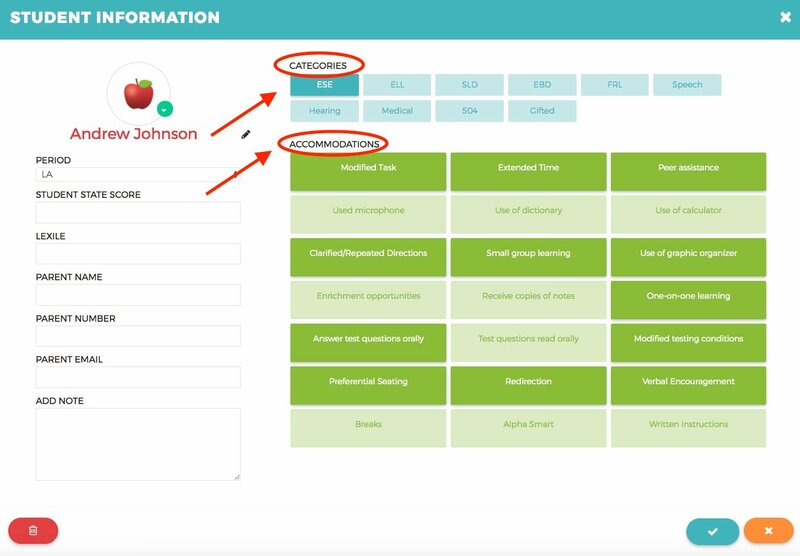 With ClassMax’s pre-filled list of accommodations, I can assign accommodations usage while I teach, never having to pause instruction or disrupt time I am spending with a student. In my own classroom, this looks like me carrying my iPad in my hands at all times, open to the current class period I am teaching. Whenever I stop to clarify instructions or to provide some one-on-one time with a student, I simply select their name and assign the accommodations to them as I stand up to continue circulating around the room. I can assign an accommodation in seconds, leaving me free to focus on students and not paperwork. Flexibility – I had to be able to add and adjust accommodations usage as I went. The majority of my ESE students function with the same basic set of 5-10 standard accommodations in their IEP. General things that good teachers are automatically doing in their classroom – preferred seating, repeating and clarifying directions, chunking information, providing copies of notes, etc. But we all have those ESE students who require more personalized needs. Hearing impaired, speech impaired, health issues, emotional behavior disorders… and the list goes on. These kids have needs above and beyond even a “typical” ESE student and I need to be able to track those, too. 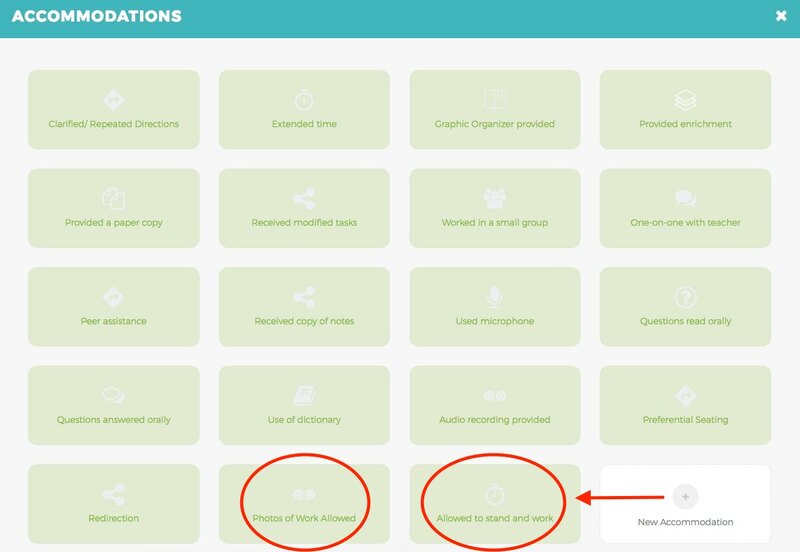 ClassMax allows me to add custom accommodations to my prefilled list, which means I add it one time and it will always show up as an option for me to select, turning my “prefilled list” into a “personalized list” in just a few seconds. Another thing I needed with regards to accommodations was a quick way to access who needed accommodations and what accommodations they were to receive. Generally speaking, as teachers, we know who needs what in our classes. But how often do particular students fall through the cracks? Students who maybe perform well, but are still struggling with significant learning disorders. Students who can compensate for their challenges, but who still need and deserve the extra help. Students who use 3 of their accommodations so often that we forget they actually are entitled to 4 other, less frequently used accommodations, too. With the color coded apples, it takes no time at all to glance at your computer or tablet screen and know right away who needs a daily check in during a class period. Five colored apples are provided for cataloguing students in a private manner that is known only to the teacher. In my classroom, all of my students are green apples, ESE students are red apples, 504 students are blue, and health issues are yellow (for me, personally, if a student qualifies for more than one of these areas, I mark them red). This keeps any student with special concerns from falling through the cracks in my classroom. Even reminding myself of what specific accommodations a student receives is quick and easy. In the Student Information profile, students are flagged by category (ESE, 504, gifted, etc.) and then their individual accommodations are listed. This means when I am working with a specific student, I can simply open their student profile and see their accommodations requirements all in the same place. While none of this is groundbreaking technology (I’m a teacher first, remember? ), ClassMax provides small details that make a teacher’s job easier and more effective. Why track data if we can’t use it effectively? Why provide accommodations if they aren’t exact information? Why collect information if we can’t use it quickly and easily to make our instruction better? At ClassMax, we believe in collecting data quickly and efficiently in real time in order to improve teaching practices. Because that’s what our students deserve. This entry was posted in Accommodations Tracking and tagged accommodations tracking, ClassMax.